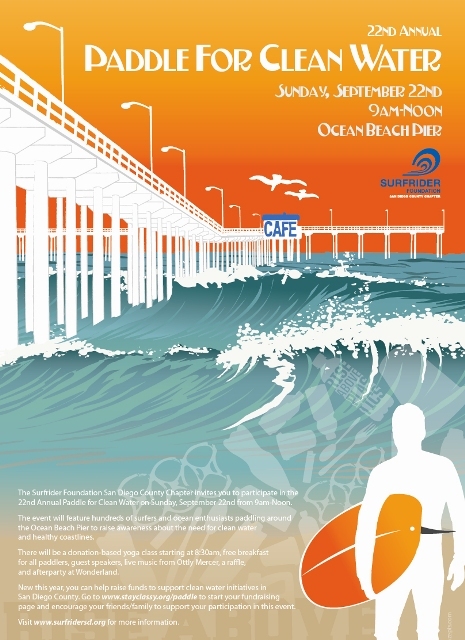 The Surfrider Foundation San Diego County Chapter’s Annual Paddle for Clean Water marks its 22nd year. The Paddle is a non-competitive event demonstrating support for pollution-free beaches and waterways. In this paddle around Southern California’s longest pier in a mass display of solidarity for the protection of our precious coastline. New this year, paddlers are able to help raise funds at stayclassy.org/paddle to support clean water initiatives in San Diego County. The morning’s festivities offer something for everyone – in and out of the water. followed by a free light breakfast for all paddlers at 9 a.m. The paddle begins at 10 a.m. with hundreds of ocean-enthusiasts of all ages making their way around the pier. After the paddle, there will be a group photo, guest speakers including City of San Diego Councilmember, Sherri Lightner and Rise Above Plastics Campaign Manager, Bill Hickman. will feature live music from local reggae band Ottly Mercer. Guests can also visit booths hosted by event sponsors including 91X, Cali Bamboo, Clif Bar, Ocean Minded, Soulr Surfboards, the Lazy Hummingbird and Eco Water. All participants are invited to a post-Paddle after party at Wonderland — Ocean Beach’s newest surfside bar and restaurant. This year’s Paddle is focused on the chapter’s Rise Above Plastics campaign, which aims to reduce the impacts of plastics in the marine environment by raising awareness about the dangers of plastic pollution, and by advocating for recycling and a reduction of single-use plastics. Not everyone who sweeps does this. I SUP though I do it in flat water only. That being said there are plenty of inexperienced prone surfers who bail their boards too when they realize they overestimated their skills paddling through waves larger than they’re used to. It is what it is and you take that risk participating in an event with this many people paddling in one spot at one time. Newer Article: Cell Phone Tower Going Up on Newport Avenue?